If you are clueless about VPN and everything here is new for you, I have a short, but definitive guide to free VPNs. Read it and come back to this post. Oh, sorry…I haven’t told you what we are reviewing today! 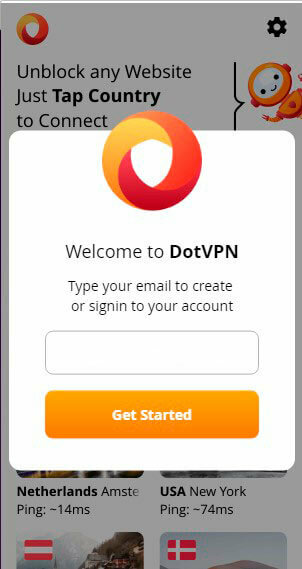 This time it’s DotVPN which ‘’better than VPN’’. This is the motto of the service claimed on the developer’s official website. Is that interesting for you? I believe YES! 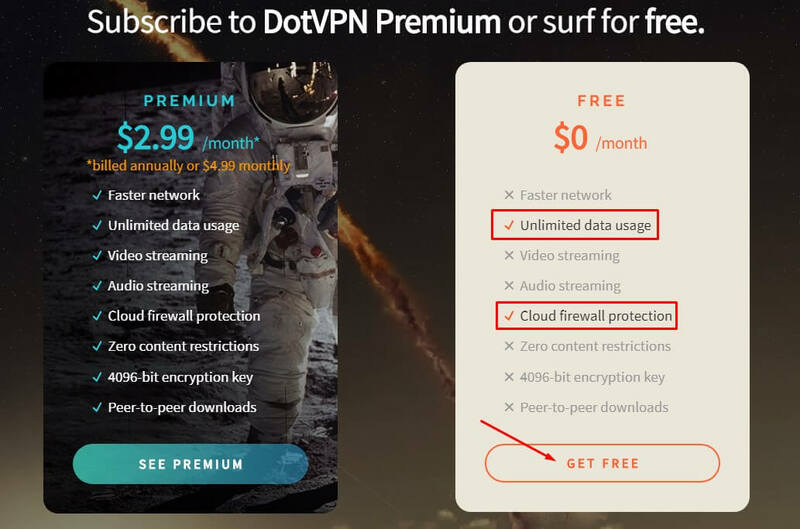 How can you use DotVPN free of charge? Internet connection performance is worse. Some content will be blocked for you. The traffic is not codified with a very strong 4096-key. Torrents are not allowed as well (only for premium users). If you are going to take advantage of free DotVPN, download its software from the website. Just click ‘’Get it free’’ and you will be redirected to the page with downloads. I’ll tell you later for what platforms you can download DotVPN. When you want to download a free VPN app, you need to know everything about its characteristics and features to understand how it works and whether it is really useful. In what countries DotVPN has servers. Free DotVPN can be added to Chrome, Opera and Firefox as browser extensions and to Android and iOS as mobile apps. As far as desktop apps are concerned, it is said that Mac and Windows apps are coming soon (If you have a look at the screenshot below, you’ll see a strange thing: available in mid-2017. Really, guys? Want to know how DotVPN Chrome extension and Android work? Ok, stay here on cooltechzone.com. 1) How to setup DotVPN Chrome? You have to download the extension from the website. That’s all! It is ready for work. It’s not difficult even for beginners. 2) What features are available for DotVPN Chrome extension? Bandwidth saver (Having activated this setting, your traffic is considered to be saved, which allows optimizing of downloading webpages). Ad block (Cool feature that makes you free from viewing annoying pop-up ads). Tracking protection (The feature will let you avoid third parties tracking your online activities). Block analytics (It’s a kind of stats about blocks). 3) What VPN servers can you connect free of charge? 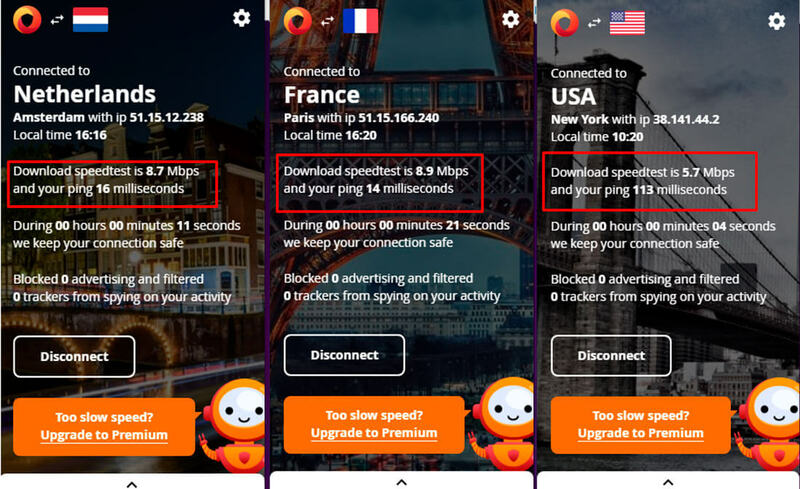 Unfortunately, users can connect only to three VPN servers located in Amsterdam (Netherlands), Paris (France) and New York (USA). It seems that it’s not enough for unblocking restricted websites. The number of VPN locations is too limited. I should notice that a user of DotVPN Chrome VPN extension can see the results of the download speedtest in the app (it is marked in red on the screenshot). How can I comment on the results? As you can see on the screenshot, the country is defined in the right way (the true geo-location is not revealed). But there is something strange with the IP addresses. With an eye toward personal privacy I’m not going to reveal my natural IP or DotVPN’s IPs, but on IP Leak test page there are different from those which are expected to be. The question is: what IP address was actually assigned? Fortunately, it was not my true one. Available on GooglePlay. A few clicks to install. 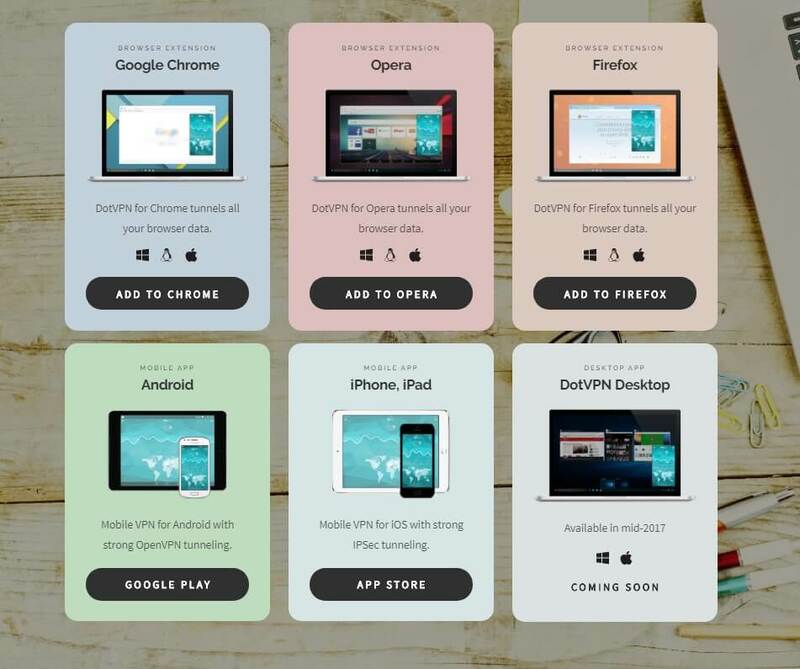 bandwidth saver, ad block, tracking protection, block analytics. Free locations available: Canada, Germany, France, Japan, Netherlands, Singapore, Spain, Sweden, Switzerland, Russia, UK, USA. 1) How to setup DotVPN Android? Type in your email and password. Click ‘’Get Started’’ and you are ready to take use of it. 2) What features are available for DotVPN Android? 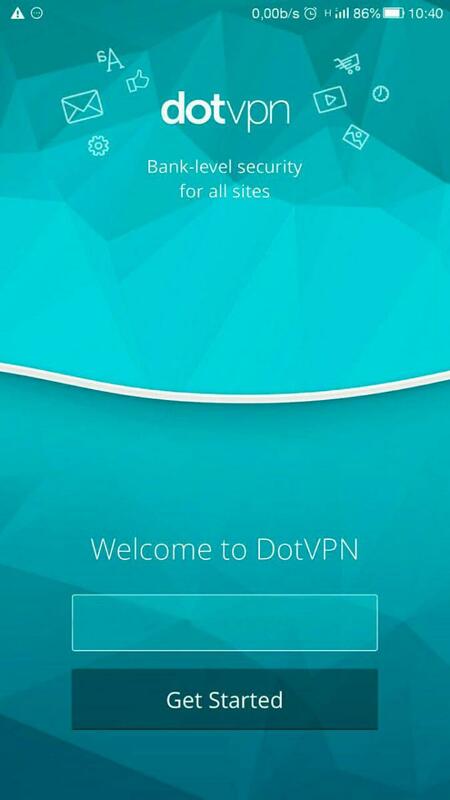 Having installed DotVPN on your Android, you will be able to take advantage if such functions as bandwidth saver, ad block, tracking protection, block analytics (see the detailed descriptions of the features in the section above). 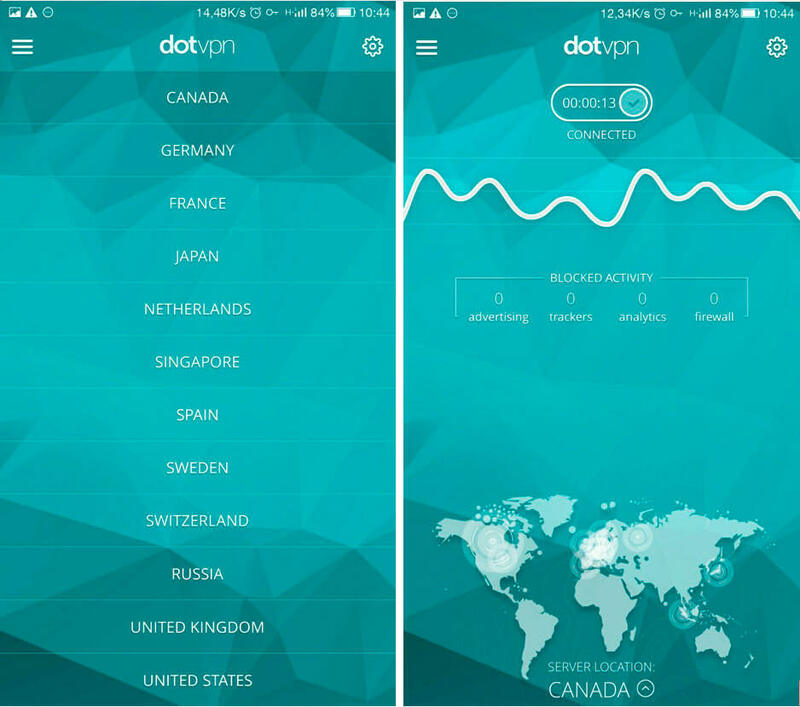 All in all, there are free DotVPN servers in 12 countries. In order to get connected to the server, you are just to choose the country, click it and wait until you see ‘’Connected’’ as it is on the screenshot. I linked to the servers in Spain, the Netherlands and Switzerland. 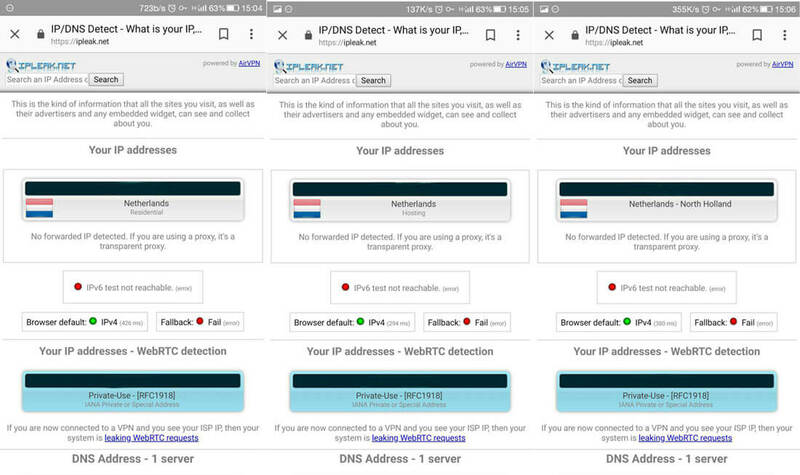 The authentic IPs and geo-location weren’t leaked, but all three tests are with the same geo-locations, though connections were performed via three different countries. Data passing protocols: SSL-Proxy – for browsers, OpenVPN – for Windows, Mac and Android, IPsec – for iOS. Encoding: 128-bit and 256-bit keys.